Whatever the scale, holding a yearly assembly, from a class to a summit, is an intense effort. The people behind its planning, organization, marketing and everything else are to be commended. 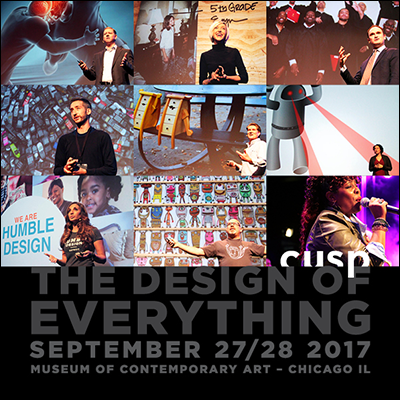 This year marks the 10th anniversary of the annual Cusp Conference, hosted in Chicago by strategic design firm Multiple. I described my first attending Cusp as “an annual gathering of creative types with a penchant for the eclectic.” Each subsequent conference has wonderfully reinforced this strong first impression. Cusp is a multicultural and multidisciplinary confection—intellectual taste buds activated. At my first Cusp experience, I encountered presentations by a pair of digital storytellers, a sword swallower, an arctic astrophysicist, an architect of space (that of low-Earth orbit) and a medical doctor behaving as a human-centered designer. This is a smidgen of the day-and-a-half strategically plotted with presentations, which cycles through the Venn of humanities, sciences and advocacy, all centered on current circumstances, collectively speaking. Constituting a professional blend—from artists and designers, to business consultants and nonprofit leaders, to students and educators, the strong variation in presenters are reflected by the attendees. The latter go to experience the former, a line-up curated to be diverse in composition and effect. The benefit is twofold: the emotional sensation of receiving a holistic boost to one’s awareness and worldview, coinciding with the practical drive to nurture one’s creativity and sharpen one’s critical thinking over time. For the past four years, I’ve had the privilege to offer Design Feast coverage on Multiple’s Cusp Conference. A continuity through my write-ups, from 2013 to 2014 to 2015 to last year, is the applied wonder by humans to discover a condition, existing or emerging, learn about it, study it and be inspired to face it, even engage it, for the sake of informing a curiosity and perhaps to realize change—for the better. Wholehearted congratulations to the team at Multiple for 10 years of galvanizing Cusp gatherings. Here’s to the next decade of perspectives—delivered from the Cusp-charged platform. Read more of my coverage of events related to creativity and design.